11.1 million people liked the image, placing Bey ahead of Selena Gomez and Cristiano Ronaldo. Beyoncé's iconic pregnancy announcement has been named by Instagram as their most 'liked' image of 2017, The Verge reports. 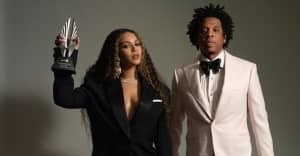 The photo, posted in February, showed Bey cradling her stomach in front of an elegant flower arrangement, alerting her 108m followers to the news that she was expecting twins. It was 'liked' 11.1m times, more than any other post on Instagram between January 1 and November 17 when the data was collected. The second most 'liked' picture of the year came from Real Madrid soccer player Cristiano Ronaldo, celebrating the birth of his twins in November. Following a theme, the third picture with the most double-taps was another from Beyoncé, also confirming that she had given birth to twins Rumi and Sir Carter in July. Clearly, the shortcut to Instagram clout in 2017 is baby related. Meanwhile, Selena Gomez remains the most followed Instagram user with 130m subscribing to her feed. She had the fourth most 'liked' picture of the year with a shot of her and best friend Francia Raisa recovering in hospital from a kidney transplant. Five of the top ten most 'liked' pictures of 2017 came from Gomez.